Twenty years in the making, 50 Years of Victory is the first Arktika-class icebreaker to have a spoon-shaped bow. Boosting the efficiency is the all-new automated digital control system. The ship, designed with a stainless steel ice belt 5 meters (18 feet) wide, breaks through ice up to 2.5 meters (9.2 feet) thick. The icebreaker is driven by 2 nuclear reactors that produce 75,000 horsepower. In open water, top speed can be as much as 21.4 knots. 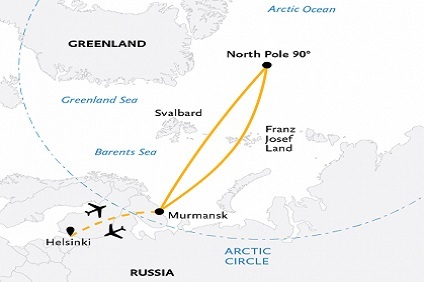 11 Night Cruise sailing from Murmansk roundtrip aboard 50 Years of Victory. Hotel stays in Helsinki pre and post cruise.